I worked on "The Trolls and the Tree" in the hottest part of this summer. The show opened August 13th at the West End Branch Library in Boston. For three weeks before that, I kept the stage up in my living room because my upstairs studio was too hot. I got more work done, too, because the stage was always right there, begging for attention. 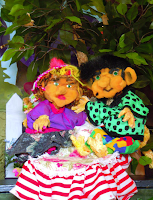 In "The Trolls and the Tree", trolls Skimpa and Blompa garden-sit for woodland fairies for a week. They move their TV in and watch a shopping show. Will Adams-Keane, a college student of many talents, filmed a nice little shopping episode, edited it, and added music. See the result on this page. Audiences and the trolls see the video through a digital photo frame, mounted on the stage. For the first show, Will and I pieced together bird and car sound effects and terrific fairy music from Alison Plante. Then, in September, Alison and I had time to work on a more complete sound track. Now the show has original, evocative music from Alison, a video segment, and a toaster that makes troll toast. 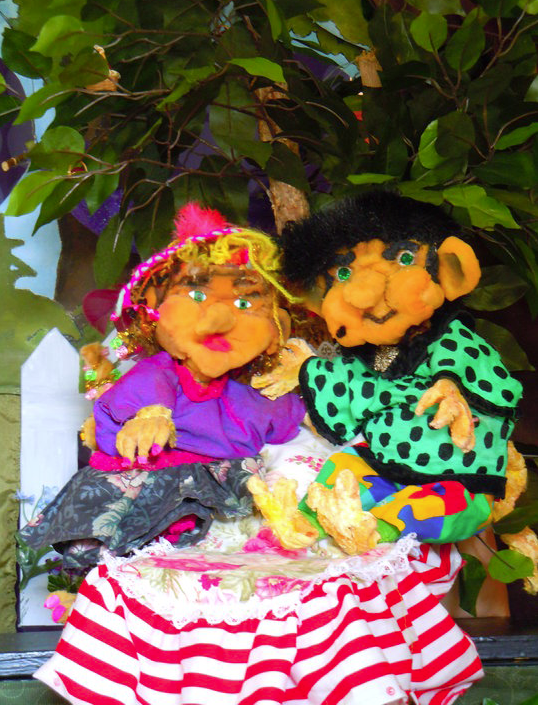 Puppetry events in Boston this fall include the "Incubator" at the Puppet Showplace in Brookline. Every other Tuesday puppeteers meet to advise and inspire each other. Schedule: puppetshowplace.org.